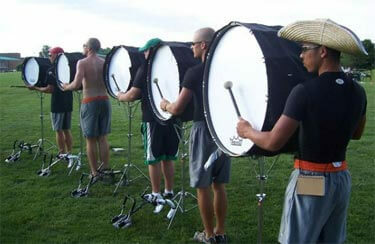 Drum corps experience: Southwind 2003 (bass line) What is your favorite drum corps story? We were at the World Championship Semifinals in 2005. One of the other bass drummers had been in the bass line with me for three years, and it was his ageout year. The show last year was awesome, especially for the bass line. He was a real rough-and-ready kind of guy, never showed much emotion, but as soon as we got off the field, he just burst into tears. It meant a lot to me that I got to be there for his last show. The Southwind bass line during a pre-season rehearsal. What is your favorite moment in your show? The opening bass break. We have a very long bass feature in the opener, so that's got to be my favorite part. What made you choose Southwind? My senior year, my girlfriend had just broken up with me, and I was pretty upset. My cousin had been marching in the Cadets, so I decided to try drum corps out. Southwind was the closest corps (I'm originally from Indiana), so I decided to try it out. I thought the same as everyone else, the corps wasn't in the top 12, so I'll just breeze into the percussion section. I got the audition piece about a week before auditions, worked it up, went to camp, and was just blown away by the amount of talent there. I scraped my way onto the bass line and had a great summer. I couldn't see any reason to leave something so good, so I've been doing it ever since. What do you miss most from home? My girlfriend's on tour with me, so that's one thing I don't miss. Probably the only thing I left back home that I normally see every day is my cat, Kiyoshi. What were you most looking forward to before tour? Has it lived up to your expectations? Just playing with the bass line. This is the most talent I've ever gotten to drum with. The guy on bass two has been with me for a couple years. Four of us are aging out, so we have four guys who are extremely mature. The fifth guy is 18 and filling a spot. He is extremely talented for his age, so just knowing we were going to be so good was really exciting. Especially when I think back to my rookie year, back then we could barely get through an eights split, and then I look at what we're drumming now. It's above and beyond my expectations. Anything else you want to say? Anyone reading, cruising on DCI.org, if you are a musician that's thinking about it, go for it. Find a corps near you. Don't restrict yourself to the top 12 corps. There is talent in any corps and any division. You'll be amazed at the trip you are about to go on.